*Deep brain stimulation can reduce seizure frequency and improve quality of life for patients with drug-resistant epilepsy. To go along with the (new) Spring 2015Â Emory Medicine magazine set of features on deep brain stimulation for depression, movement disordersÂ and epilepsy, here is a fascinating 2013 case report from Emory neurosurgeon Robert Gross and colleagues. The first author is electrical engineer Otis Smart. Itâ€™s an example of the kinds of insights that can be obtained from implantable electrical stimulation devices, which can record signals from seizures inside the brain over long periods of time (more than a year). It’s been a little while since we had an Intriguing Image. This video illustrates a surgical technique for the treatment of medication-resistant temporal lobe epilepsy. In this procedure, which is designed to minimize cognitive side effects, the surgeon carefully uses a laser probe to heat and ablate the regions of the brain doctors think are important for seizures. Magnetic resonance imaging allows the temperature in the brain to be precisely monitored. The video was provided by Robert Gross, MD, PhD, and accompanies an upcoming paper in the journal Neurosurgery. More discussion of this procedureÂ here and here. Oncologist Johann Brandes and colleagues from Winship Cancer Institute have a recent study on the preventive effects of valproate, now prescribed for epilepsy and bipolar disorder, against head and neck cancer. Published in Cancer, it was a clever example of number crunching, using data from the Veteransâ€™ Administration. If you want to know about the anticancer effects of a widely used drug, check whoâ€™s already taking it for another reason (25,000 veterans were taking it). The results suggest that valproate â€“ OR a drug that works with a similar mechanism â€“ might be used to prevent head and neck cancer in patients who are at high risk. Also see this related paper from Brandes and colleagues on chemoprevention in lung cancer. However, any examination of valproate should take into account neurologist Kim Meadorâ€™s work on antiepileptic drugs taken by pregnant women — he was at Emory for several years but recently moved to Stanford. His work with the NEAD study definitively showed that valproate, taken during pregnancy, increases the risk of birth defects and intellectual disability in children. Thereâ€™s even more about valproate: it might help tone-deaf adults learn to differentiate musical tones, according to one study. It has been used to enhance the reprogramming of somatic cells into induced pluripotent stem cells. It seems that valproate just shakes things up, turning on genes that have been off, erasing decisions that cells have already made. Valproate is a tricky drug, with several modes of action: it blocks sodium channels, enhances the effects of the inhibitory neurotransmitter GABA, and inhibits histone deacetylases. Although the first two may be contributing to the antiepileptic effects, the last one may be contributing to longer-lasting changes. Histone deacetylases are a way a cell keeps genes turned off; inhibit them and you loosen things up, allowing the remodeling of chromatin and unearthing genes that were silenced. In tumors, genes that prevent runaway growth are silenced. It may be that valproate is loosening chromatin enough to allow the growth control machinery to reemerge, although the effects observed in the Brandes paper are specific for head and neck cancer, and not other forms of cancer. The data suggest that valproate has a preventive effect with respect to smoking-related cancers and not viral-related cancers. With adults at high risk of cancer recurrence, side effects from valproate may be more acceptable than in other situations. Even so, with follow-up research, it may be possible to isolate where the anticancer effects of valproate come from â€“ that is, which histone deacetylase in particular is responsible â€“ find a more specific drug, and avoid potential broad side effects. This is a continuation of previous posts on individualized treatment for infantile-onset epilepsy, made possible by Emory scientists Stephen Traynelis and Hongjie Yuanâ€™s collaboration with the NIH Undiagnosed Diseases Program. A companion paper containing some clinical details was recently published in Annals of Clinical and Translational Neurology. Memantine, which was found to be effective for this particular child, is normally used to treat symptoms of Alzheimerâ€™s disease. He has a mutation in a gene encoding a NMDA receptor, an important signaling molecule in the brain, which hyperactivates the receptor. Treatment with memantine reduced his seizure frequency from 11 per week to three per week, and eliminated one type of seizure, myoclonic jerks. It allowed doctors to taper off conventional anticonvulsant drugs, which were having little effect anyway. His cognitive ability has remained unchanged. The team also discovered that the compound dextromethorphan, found in many over-the-counter cough medicines, was effective in the laboratory in counteracting the effects of a GRIN2A mutation found in another patient. However, these effects were mutually exclusive, because the molecular effects of the mutations are different; memantine helps L812M, while dextromethorphan helps N615K. Yuan and Traynelis report they have an Fake Oakleys ongoing collaboration with UDP investigators to analyze the effects of mutations in NMDA receptor genes. That means more intriguing case reports are coming, they say. For this patient, investigators were able to find the Ray Ban Baratas cause for a previously difficult to diagnose case, and then use a medication usually used for Alzheimerâ€™s disease (memantine) to reduce his seizure frequency. How often can doctors go from encountering a patient with a mysterious disease, to finding a mutation in a gene that causes that disease, to developing a treatment crafted for that mutation? This is true personalized molecular medicine, but itâ€™s quite rare. How rare this is, Iâ€™d like to explore more, but first I should explain the basics. At Emory, Stephen Traynelis and Hongjie Yuan have been working with Tyler Pierson, David Adams, William Gahl, Cornelius Boerkoel and doctors at the National Institutes of Healthâ€™s Undiagnosed Diseases Program (UDP) to investigate the effects of mutations in the GRIN2A gene. Their report on the molecular effects of one such mutation, which caused early-onset epilepsy and intractable seizures in a UDP patient, was recently published in Nature Communications. How much is the development of epilepsy like arthritis? More than you might expect. Inflammation, or the overactivation of the immune system, appears to be involved in both. In addition, for both diseases, inhibiting the enzyme COX-2 initially looked like a promising approach. COX-2 (cyclooxygenase 2) is a target of traditional non-steroid anti-inflammatory drugs like aspirin and ibuprofen, as well as more selective drugs such as Celebrex. With arthritis, selectively inhibiting COX-2 relieves pain and inflammation, but turns out to have the side effect of increasing the risk of heart attack and stroke. In the development of epilepsy, inhibiting COX-2 turns out to be complicated as well.Â Ray Dingledine, chair of pharmacology at Emory, and colleagues have a new paper showing that COX-2 has both protective and harmful effects in mice after status epilepticus, depending on the timing and what cells the enzyme comes from. Status epilepticus is a period of continuous seizures leading to neurodegeneration, used as a model for the development of epilepsy. Postdoc Geidy Serrano, now at the Banner Sun Health Research Institute in Arizona, is first author of the paper in Journal of Neuroscience. She and Dingledine were able to dissect COX-2â€™s effects because they engineered mice to have a deletion of the COX-2 gene, but only in some parts of the brain. They show that deleting COX-2 in the brain reduces the level of inflammatory molecules produced by neurons, but this is the reverse effect of deleting it all over the body or inhibiting the enzyme with drugs. 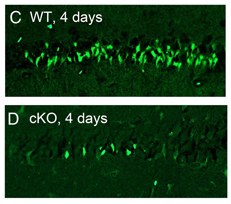 Four days after status epilepticus, fewer neurons are damaged (bright green) in the neuronal COX-2 knockout mice. First, COX-2 itself is probably not a good target for antiepileptic therapy, and it may be better to go downstream, to prostaglandin receptors like EP2. Second, the timing of intervention will be important, because the same enzyme has opposing actions a few hours after status epilepticus compared to a couple days later. More of Dingledineâ€™s thinking about inflammation in the development of epilepsy can be found in a recent review. An article in the April 2011 issue of Nature Medicine highlights the mechanistic overlap between autism and epilepsy. By studying how rare genetic conditions known to coincide with both epilepsy and autismâ€”such as Rett syndrome, fragile X syndrome and tuberous sclerosisâ€”unfold at an early age, neuroscientists are finding that both disorders may alter some of the same neural receptors, signaling molecules and proteins involved in the development of brain cell synapses. Emory cell biologist Gary Bassell and his colleagues have been taking exactly this approach. Recently they published a paper in Journal of Neuroscience, showing that the protein missing in fragile X syndrome, FMRP, regulates expression of an ion channel linked to epilepsy. This could provide a partial explanation for the link between fragile X syndrome and epilepsy. The Nature Medicine article also mentions a drug strategy, targeting the mTOR pathway, which Bassell’s group has been exploring with fragile X syndrome.